Product prices and availability are accurate as of 2019-04-15 03:04:28 UTC and are subject to change. Any price and availability information displayed on http://www.amazon.com/ at the time of purchase will apply to the purchase of this product. The U.S. Armed Forces' best-kept secret now available in the consumer market. Performance-tested sunglasses with classic aviator styling. The General has been a favorite of U.S. military pilots for more than 50 years. Engineered to rigid military specifications and issued to millions of U.S. 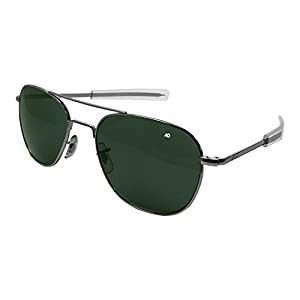 Soldiers, Sailors, Marines and Airmen since 1958.The rugged and sturdy structure and high quality finishing of the steel alloy frame coupled with distortion free, toughened and polished True Color glass lens have made the AO Flight Gear Collection the standard bearer of all fine military sunglasses. To measure for frame sizing; First, stand in front of a mirror. Second, Hold a ruler so one end is lined up with your right temple and the ruler goes over the bridge of the nose. Third, measure distance between your temples to the nearest 1/4 inch. For better accuracy, measure to 1/8th inch. Keep ruller straight, avoid bending ruler. For Frames 52mm-up to 5 inches. For frames 55mm 5 inches to 5 1/2 inches. For 57 and 58mm-5/12 to 6 inces. Please note, temple lenght is determined by frame size. Warranty;For one year from date of purchase, AO Eyewear will repair or replace this eyewear (at their option) if defective in material or workmanship. No warranty is expressed or implied regarding damage resulting from consumer misuse or neglect or for any consequential damages arising out of the use of the glasses.